After a month devoted to grilled cheese, allow me to take a brief break from sandwiches and try something a little different on the panini grill. Like churros. If you’ve ever had a fresh churro, hot out of the fryer, its ridges sparkling with cinnamon and sugar then you know the magic of this Spanish doughnut. I credit a Panini Happy reader for starting me along the path of trying to make Grilled Churros. Actually, she e-mailed me about making beignets on the panini grill, a similar concept that I’d love to try soon. But she got me thinking about grilling doughnuts in general. Since it’s almost Cinco de Mayo, why not grill a type that’s popular in Mexico? Plus, they’ve got ridges! 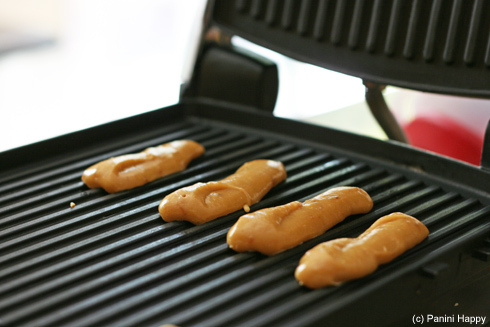 The technique was really simple – rather than pipe the pâte à choux (pastry dough) into hot oil, I applied it directly to the panini grill grates. With traditional churros you use a star tip to make ridges in the dough, but here the grates took care of that job. After five minutes I took them off the grill and brushed a little melted butter over the ridges, which drew the cinnamon sugar like a magnet. Finally, I made a quick Nutella sauce for dipping. Obviously, I’m taking some liberties with calling these little finger-shaped pastries churros. Since they’re grilled, their texture is softer and more tender rather than crispy like the traditional deep-fried version. But they’re oblong and skinny like a churro, they’re made of pastry dough like a churro, they have ridges like a churro and they’re coated in cinnamon sugar like a churro. Whatever you decide to call them, they make a great sweet breakfast treat. Preheat the panini grill to high heat, about 425°F. In a medium saucepan, combine 1 cup water, brown sugar, salt and 1/3 cup butter and bring to a boil, 10 to 12 minutes. Remove from heat and add flour all at once, stirring vigorously with a large wooden spoon until well blended and the mixture pulls away from the side of the bowl. Transfer to a bowl and let cool 5 minutes. Beat in eggs one at a time, making sure the dough is smooth before adding the next egg. Add in the vanilla. Beat the dough until it is smooth and shiny. Spoon the dough into a pastry bag (or a plastic bag with a corner snipped off to create a narrow opening). Working in batches, squeeze dough directly onto the panini grill in 4-inch strips, leaving space for each churro to expand. Close the grill lid, leaving about 1/8″-1/4″ of space between the dough and the lid. Grill for 5 minutes or until browned and cooked through. While the churros are grilling, heat the Nutella and milk in a small saucepan over medium heat until combined well and heated through. Transfer Nutella sauce to a small dipping bowl. In a large plastic or paper bag, combine sugar and cinnamon. Brush melted butter over the churros, add them to the cinnamon sugar and shake the bag to coat. 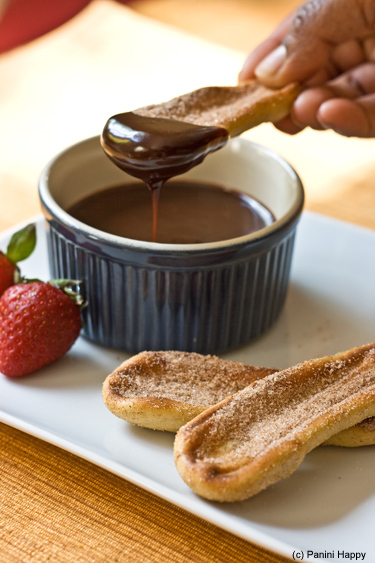 Serve warm with Nutella sauce for dipping. It looks like they turned out just gorgeous, Kathy! I love churros, so this is definitely going on my must-make list. What an ingenious way to make churros!! Love it. What a great alternative to frying! Ooo, I like these! I’m not a fan of frying anything, these are a great lower-fat alternative to traditional churros. Now you’re making me want to get a panini grill just for this recipe. Your churros look yummy! This is a fantastic idea, Kathy. I never would have though of making churros this way. Ooo, I love these! 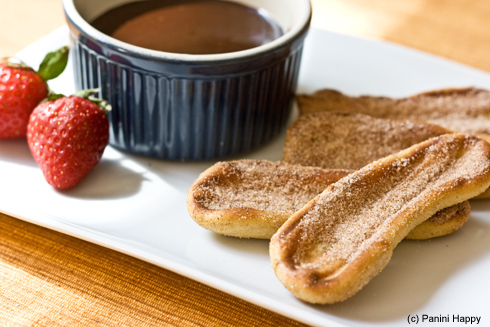 What a wonderful idea to make churros! I’m not a fan of frying, but love churros. I know what I’ll be trying this weekend. Thanks Kathy!! I can’t wait to try these. I never thought to grill churros! Genius! This is brilliant! I love churros but hate frying stuff, so I will have to give this a try! Hmmm…I think I may have to try this! I love churros, but haven’t seen them anywhere here in Kentucky! Mine came out like soggy pancakes. Tips? They certainly shouldn’t be soggy. What was the consistency of the batter before it went on the grill? Sounds like perhaps they weren’t cooked through long enough (if they were wet at all) or perhaps an ingredient may have been missing? I made sure to double check all the ingredients. The dough was thick and sticky. Does using a mixer affect the dough? A mixer could affect things. Your dough sounds like it was the right consistency. It’s hard to know exactly where things went awry without actually observing what happened. Different grills also heat differently, there are lots of variables that could cause different results. Whatever went wrong, I’m sorry it didn’t work well for you. Previous post: National Food Blogger Bake Sale ~ Sat, May 14!